David’s setting of Christ has no body now but yours in a Welsh translation by Ceri Wyn Jones was sung by the choir of Bangor Cathedral directed by Paul Booth in a live broadcast on BBC Radio 4. The text is attributed to the Spanish mystic, Saint Teresa of Avila. The broadcast can be heard for 30 days on BBC iPlayer and the piece begins at 27 minutes 43 seconds. A celebratory concert marking the 150th anniversary of All Saints’ Church, Clifton and the 100th birthday of one of America’s greatest conductors and composers, Leonard Bernstein with a performance of his dramatic Chichester Psalms. The concert includes Janácek’s restful setting of the Lord’s Prayer and the rarely-heard Hymne: Wie lieblich sind deine Wohnungen for ladies’ voices by the 19th century composer Josef Rheinberger. The choir gives the first performance of a new work for men’s choir by the young composer Amy Summers, one of this year’s City of Bristol Choir Scholars, and the final two works of the programme set vivid and passionate words by 17th century poets: Finzi’s wonderful melodious festival anthem Lo, the full, final sacrifice, and the dramatic cantata Crucifixus pro nobis by the Yorkshire-born composer Kenneth Leighton. Tickets £15 for adults, £5 for students/under 18s, available online from City of Bristol Choir and from the choir’s ticket line 0117 950 7055. Exultate Singers presents an Evening Serenade of romantic music from around the globe. The choir will be joined by the internationally-renowned guitarist Craig Ogden and the virtuoso cellist Richard May for performances of wonderfully atmospheric pieces that travel from the calm and stillness of Samuel Barber’s Sure on this shining night to the energetic samba rhythms of Brazilian folk songs. The central work of the concert is a suite of seven vivid settings of Lorca poems for choir and guitar by the Spanish composer Castelnuovo-Tedesco, described by Segovia as ‘the first composer I have met who immediately understands how to write for the guitar’. The Spanish fervour of much of the music is contrasted by reflective songs by Britten, Holst and the Latvian composer Ēriks Ešenvalds. Stars sets a poem by Sara Teasdale in which the choir not only sing but play chords on tuned wine glasses, creating a mystical, cosmic experience. Tickets £18 / £13 / £10, available online from the Exultate Singers shop and from Opus 13 music shop on 0117 923 0164 or over the counter at the shop at 14 St Michael’s Hill. City of Bristol Choir: Saints Alive! A concert of music inspired by the saints, performed by City of Bristol Choir, conducted by David, with the tenor soloist Ben Thapa and organist Richard Johnson. The programme includes music by Howells, Harris, Britten, Stanford and Finzi, and Kodály’s Missa Brevis, a dramatic and emotional prayer for peace. Tickets £15 (under 18s and students £5) from www.cityofbristolchoir.org.uk and by phone on 0117 950 7055 or from Opus 13 music shop on 0117 923 0164. David conducts Exultate Singers in a concert of ethereal and powerful music featuring two world premieres by leading British composers. Sicut Cervus is a brand new anthem commissioned by Exultate Singers from the celebrated composer Sir James MacMillan. Wanderlust, a work commissioned from Toby Young, explores feelings of loss and homelessness across different cultures. Through first-hand stories, original poetry, and haunting music the work explores the pain of those away from home, whether fighting on the front line or seeking refuge, as well as the strength and resilience shown by humanity all over the world. British choral gems by Tavener, Harris, Parry, Elgar and Howells complete the programme. David conducts Exultate Singers in concerts at the Duomo di Taormina on 22 October and Chiesa San Carlo, Noto on 24 October. Entry to the concerts, which begin at 8pm, is free. The choir will sing Sunday mass at the Duomo di Taormina at 11am. David conducted a live broadcast of Sunday Worship for BBC Radio 4, sung by the parish church choir of Westbury-on-Trym Parish Church with the organist Richard Johnson. The service was led by Father André Hart and the preacher was Canon Bruce Saunders. The service featured a new anthem written by David specially for the broadcast, Harvest Blessings. 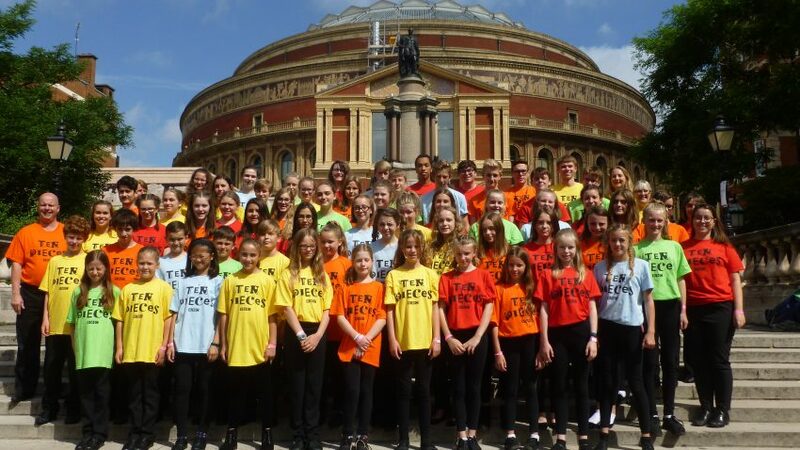 Choristers from Westbury-on-Trym Parish Church and singers from Bristol Youth Choir sang at the Royal Albert Hall at the Ten Pieces Proms, joining singers from around the UK to form the Ten Pieces Children’s Choir. They performed an excerpt from Elgar’s The Music Makers, the opening movement of Vivaldi’s Gloria, and No Place Like Home, a new commission by Kerry Andrew. The 6pm concert was broadcast live on BBC Radio 3 and will be shown on CBBC later in the year.